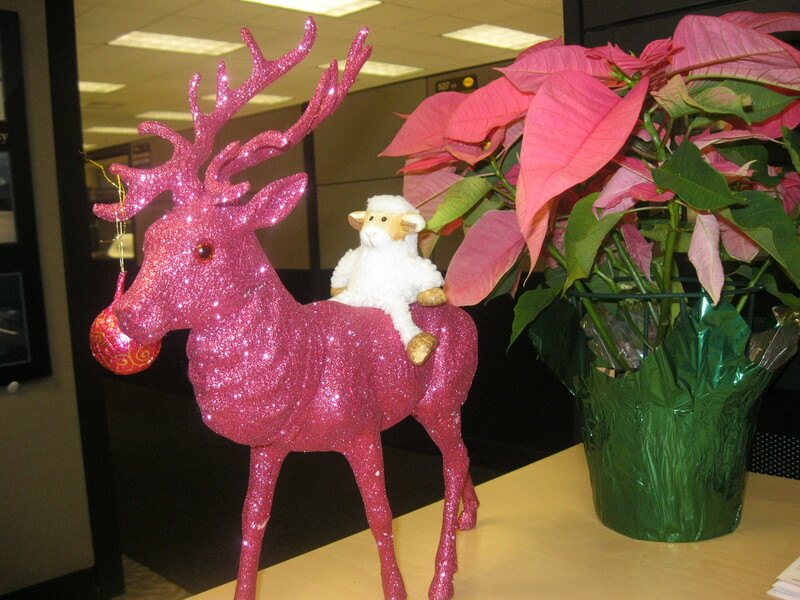 Is everyone ready for the holidays? I am. 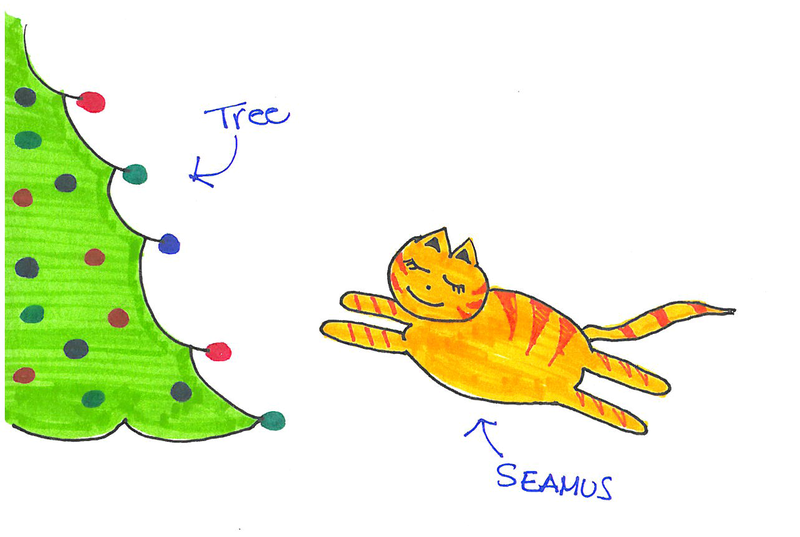 You all know that my tree is up and my house is decorated and that Seamus is having a love affair with the tree. I have gifts under there now and he still picks his way over them to wad himself up in the back under the pretty lights. 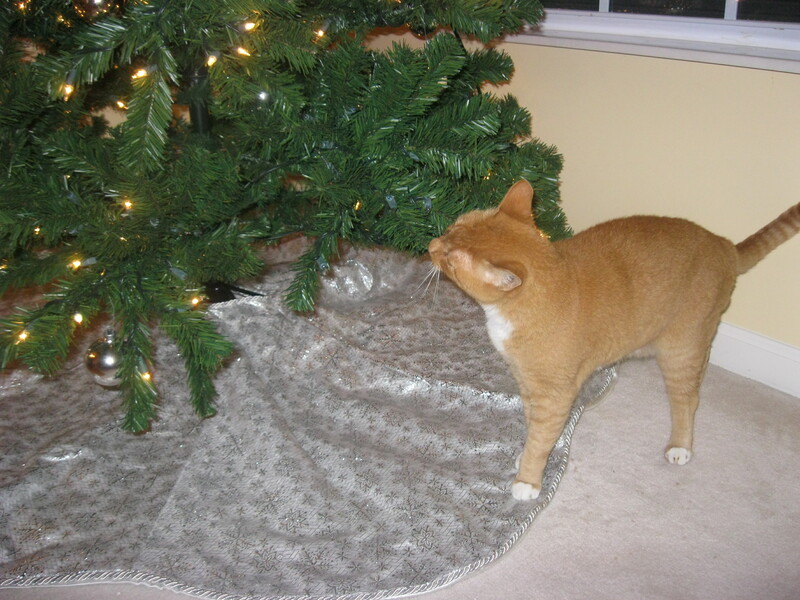 I think he has been very delicate as I have yet to find a shredded present. They are all still very much intact. 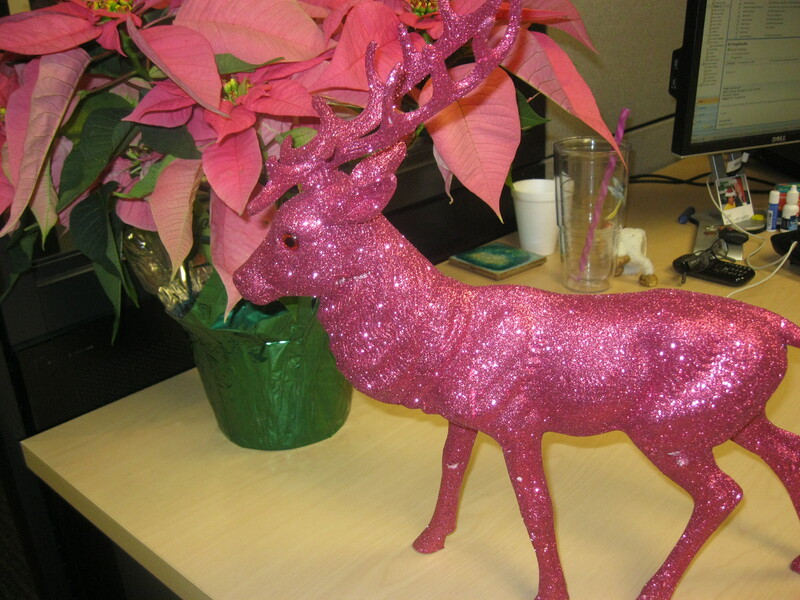 This is a glittery pink reindeer (or some such animal) that was given to me as a gag gift a few years ago and you know, I just can’t keep it to myself. 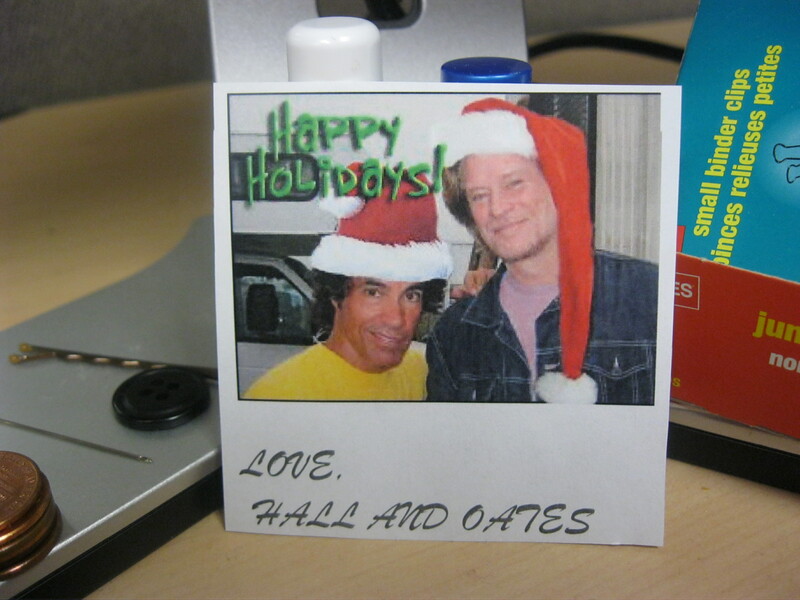 EVERYONE gets to experience the glam so I bring him to work for all to enjoy. Isn’t he cute? 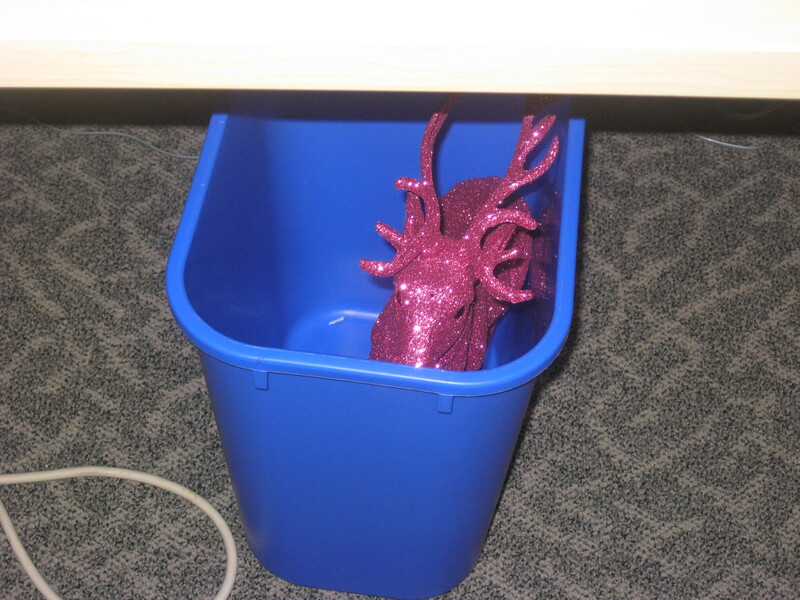 Since then, Always Keith has renamed him The Pink Dragon and every day when I arrive at work, I have to search for him. He and The Hulk hide him somewhere close by, usually near the men’s bathroom or in a break room. 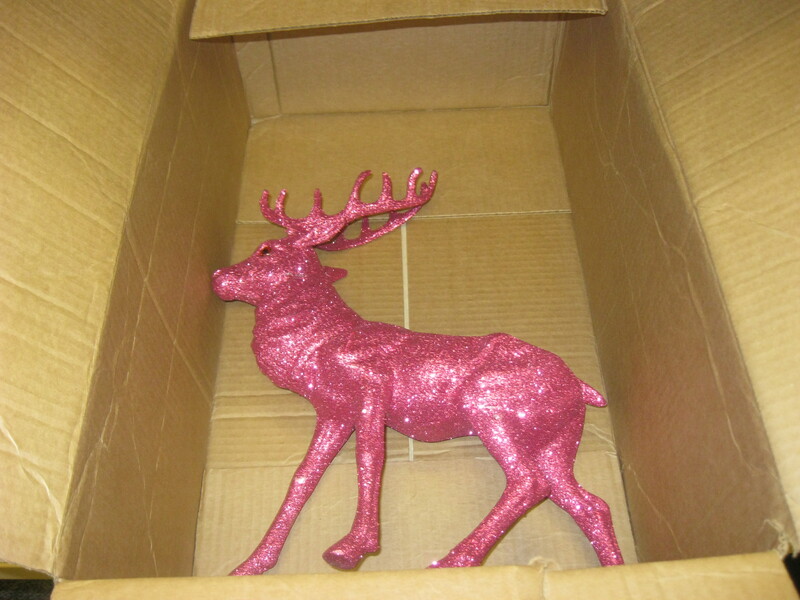 My favorite was the day he was packed up in a box and delivered from the mailroom. Merry Christmas to you! I’ll have a more serious post on Christmas Day, I’m hoping, but for now, safe travels to you all and happy gifting. Presents are fun! I’m Not Sure I’m Cut Out To Be A Parent: Or, Oh Murphy . . . . . So it turns out that Murphy is a brawler. My sweet little annoying ten pound cat got outside last week and it wasn’t long before I started to hear some truly terrible noises coming from the street. It was a cross between a cat being smushed by the tire of a car and children screeching at each other in a sing-song “somebody’s gonna get it” refrain. With heart threatening to pound right out of my throat, I threw open the front door and bolted out my walkway, barefoot and wearing decidedly inappropriate pajamas, only to find my affectionate beloved orange puffball beating the absolute snot out of another cat. You may have many reasons to think me naïve or call me a bit of a ditz, but give me credit for having sense enough to not break up a cat fight, especially seeing as how skinny little Murphy was blown up like a watermelon, tail twitching with his ears laid back flat. 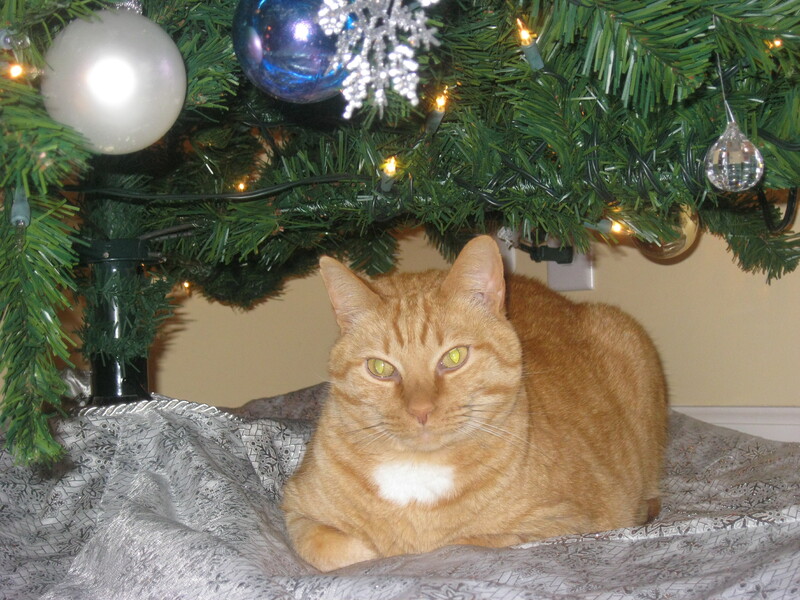 I scurried back into the house to wait it out while Seamus paced nervously by the front door and eventually settled in his new safe place under the lighted Christmas tree. Within the hour, Murphy yowled at the front door to be let in, and in he stalked, looking a little more broad through the shoulders and with a bit of swagger. Later, he sat at my feet as I “powdered my nose” (something he does without fail nearly every single time I have to go) and looked up at me with sleepy and peaceful eyes. He was completely serene. I noticed he had a small chunk missing from his ear and as I raked my fingers through his fur, I dislodged pieces of cat claw. Then all throughout the night he would leave the bed where he was cuddled up next to me to visit the toilet and splash around in there, maybe washing himself of his bad behavior? Whatever his reasons, I woke up to water all over the seat and floor. I’ll say it again – I suppose getting a red-headed cat and giving him an Irish name and plenty of opportunity to drink (from the toilet) was a bad idea if I wanted a docile lazy aloof cat. That’ll teach me. Part of my Christmas season every year is the cookie baking. This year was no different. I invited a bunch of friends over, gave each of them a small list of ingredients to bring and cleaned my house. I invited Dammit Todd to my little shindig too. See, I make these rice krispie things that have lots of peanut butter and chocolate in them and when the cookies get set and hardened in the pan, they are very hard to cut. 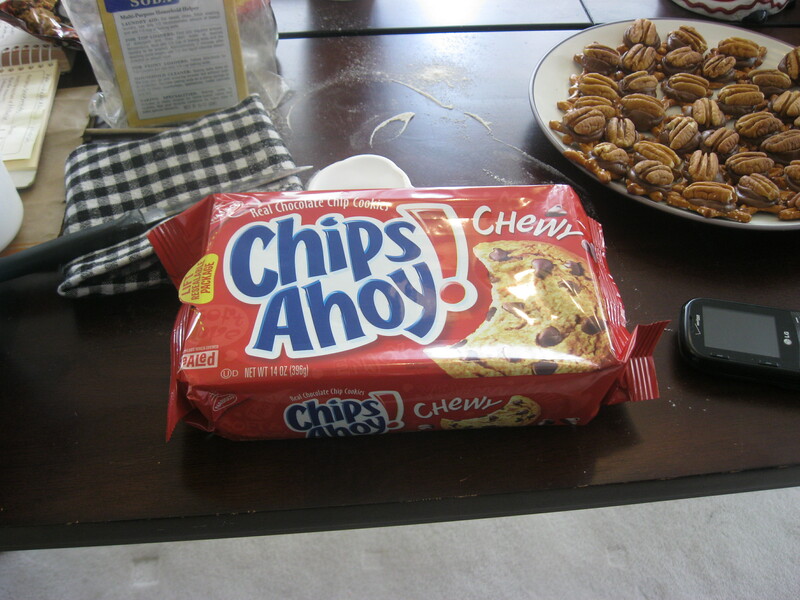 I was crafty and smart – I bribed Dammit Todd with a house full of women, free cookies and milk. Lo and behold, he agreed to come over to cut the difficult cookies and partake in free cookies and milk. Score. The girls and I were involved in our controlled chaos of cookie baking when Dammit Todd arrived with himself and a contribution to the party – a total surprise as I really only needed him for the strength of his arms and the pleasure of his company. Do you see why we call him Dammit Todd?